Why is Clothesline Laundry the top choice for laundry pickup service? Laundry is personal and something we take seriously. Tell us exactly how you want yours done & we’ll do it. Everything from what soaps and wash temps you like to how you want your clothes folded. From your dirty socks to the blanket your grandma knitted, our experienced laundry specialists will care for your clothes as if they were their own. You can trust Clothesline Laundry to treat your items with care. Crave routine? Tell us when to come and we’ll be there every week. Prefer a bit more flexibility? Use us when you need us. 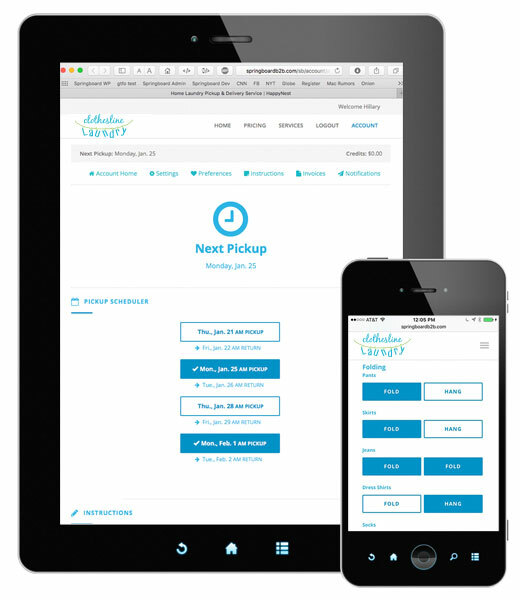 Laundry pickup for singles, families, and businesses is just a tap, click or text away. Not only will you be saving hours when you switch to laundry service, you’ll also be lowering your water & energy costs. Our pickup laundry service is affordable & economical. Save with weekly, or bi-weekly plans, or schedule by request. *Now offering Veteran discounts! Please call customer service at (516) 874-4077 for more information. Seventh Generation natural detergent? Of course.